Fairy Cardmaker: One UFO Down! I did it! In fact, I doubly did it! I completed one UnFinished Object that has been on my to-do list for a couple of years. 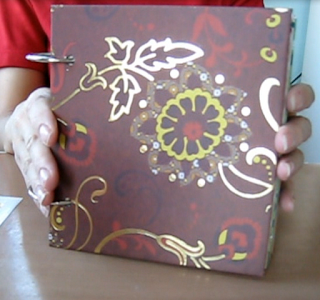 I made a Holiday Card Keeper from a pocket page mini-album tutorial I found by LittlePeaceOfMyHrt. I actually modified the measurements of the tutorial. The tutorial creates a pocket page that is 6 inches long by 5 inches wide and binds it in a landscape position. I would do that for a mini-album to help stop dust from falling in the pockets. However, for my card keeper, I wanted to bind it in a portrait orientation. So, I made my pockets 5.5 inches wide by 6 inches tall to make room for the binding. The pockets on the insides of the covers are 5.25 inches wide by 5.75 inches tall. How did I double do it? Not only did I finish this project, but I made a video to show it off. My first video!! I shot it with my point and shoot camera and I even added captions. I'm so proud of me and my very bare bones basic video. You can see the insides of my Holiday Card Keeper in this short video on my new Vimeo Channel! I hope everyone is keeping crafty! Awesome idea, like it alot !!! Cute card keeper! And great job on your first video!! Your card keeeper is adorable. Ha! Awesome! I have like a kazillion unfinished objects that will probably never get done! !